Art-filled One Bedroom With Garden Access And Studio. 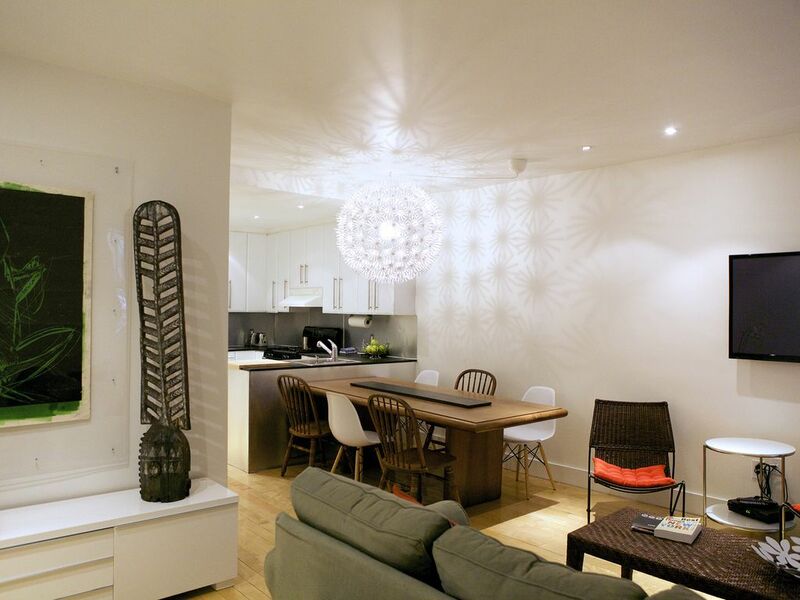 Our beautiful, art-filled garden apartment is now available for holiday rental! Just two blocks from the subway and several grocery stores, smack in the middle of happening Harlem, walking distance to Columbia University, nine blocks from Central Park, it occupies the garden floor of the house we live in. We are a European-American family, and well familiar with both ways of life, so you will have no surprises! Walk through your private entrance garden into the living room. With a large screen TV and a comfortable pull out couch, it can serve as your second bedroom. A large massive oak dining table accommodates up to six people for your own Harlem dinner party! The kitchen is fully stocked, and a dishwasher takes care of the clean up. A long art-filled gallery leads to the back of the apartment, were your bedroom overlooks the quiet garden. The bathroom is modern and clean. And your huge walk-in closet will house all of your clothes along with the suitcases, skis, golfing gear, whatever! Off the bedroom you can work in your own studio, a tiny enclave where you can write your emails, browse the web or start that novel you have been thinking of writing. Internet access is free! From the studio you can pop into the ivy-covered garden, with its hammock, large dining table and flowering vines. english, french, german, italian, mandarin, Schwitzerdütsch! World-traveler, born in Germany, multi-lingual, renowned designer with my own company- and yes, I renovated this apartment! We live right upstairs! Harlem is my love. Since I was a kid, I thought of Harlem as this great, multi-cultural place- and I was not wrong! Anyone who lives in Manhattan would love to live here, with our beautiful old townhouses and lush gardens! This house was a blank canvas when we bought it- nothing to stop my implementing my ideas of a modern, clean, high-end designed home. Tub, shower, and clean white design in this large bathroom. Wifi enabled. Enter the password, and go! TV with cable, pull out sofa, comfortable chairs. Quiet- what else do you need to know? Not American-size huge, but still bigger than most european ones! Gas stove with four burners. Herbs, oils, soap, and sundry. Assorted stylish selection enough for a dinner party for 6. Quiet dishwasher, pots, pans, stove-top espresso maker, and all basic herbs and cooking implements! Large solid oak dining room table. 53' wide-screen ultra flat TV in the living room. All the channels you could wish for. Now get out of the house! Shared garden space- we also come out there, but chances are you'll be alone. Your private deck with a small dining area. PLEASE NOTE THAT MY MAXIMUM OCCUPANCY IS 4 GUESTS! The owner is a very nice person to deal with. She has decoreated the apartment with various nice drawings, some made also by herself. The apartment is very spacious, good for a couple or three people, it is well funrnished, all appliuances work very well. I was there for about a month, moving from the faomus Upper West, but I wish I could have stayed longer this artistic apt of Harlem! Great place, great hostess, great location!!! We had a wonderful week's holiday here. The apartment is quiet (a necessity for us), comfortable, well appointed and incredibly well-located (3 short blocks from the subway). Katrin was very responsive and most accommodating. All in all, a great home base for a visit to NYC. P.s. Don't miss the opportunity to explore Harlem - an amazing area. We would not wish to stay anywhere else as comforts of home are here, it is very spacious and well appointed. The kitchen is a great open plan space perfect for cooking for friends and family. Our first time in Harlem was worthwhile. Apartment was very clean, spacious, quiet, great location, well-equipped, comfotable king bed, good restaurants in walking distance. We stayed in Katrin’s apt for the past week. We were a little apprehensive about booking in Harlem but after spending time in this wonderful city and particularly in Harlem we found the people friendly and so very helpful, specially with directions. The apt was well equipped and Katrin was available by text to answer any questions we had. The backyard garden was a great oasis after sightseeing all day. The location three short, well lit, busy blocks from the express train was ideal, especially as a single, female traveler. The apartment was clean and spacious. Everything worked well, including dependable internet service. I love the large, thick towels and having a bath scale kept my eating on track. I totally enjoyed the apartment and plan to return. Harlem is the most happening neighborhood in New York right now! Have you eaten at Red Rooster? Have you listened to Jazz at Cecil's? Have you gone to church at St. John the Divine? Have you visited Columbia University? Have you seen the New York Marathon? Have you checked out Amateur Night at the Apollo? Have you biked around Central Park? Have you been to the Guggenheim? All these are within 15 walking minutes from our house!